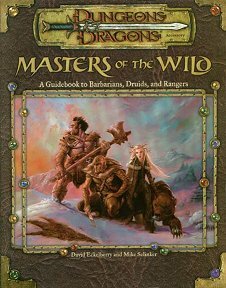 The goodies herein include new feats, weapons, spells, and magic items; improved and more detailed rules for the wild shape ability; new prestige classes such as the frenzied berserker, the windrider, and the oozemaster and even a new type of magic item - the infusion. Publisher's blurb: "These Forces of Nature Can Weather Any Storm. Barbarians, druids, and rangers are the rugged and noble champions of untamed lands. This book teems with new ways to customize even the most seasoned characters."